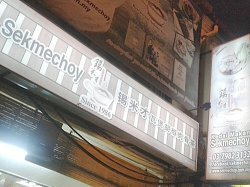 Restaurant SekMeChoy, is considered as an old restaurant which located at Jalan Besar, Salak Selatan, also known as Salak South Old Town. 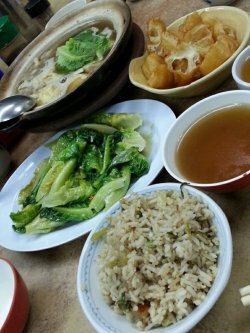 They are serving a wide range of delicious home-cooked dishes, and they have been attracted many regular customers who have become their supporters over the years. 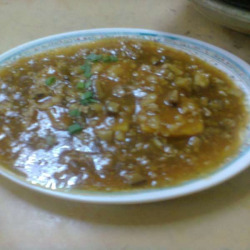 Steamed Tofu with Fish Paste & Egg 鱼滑豆腐, is one of the popular ‘must try’ dish. 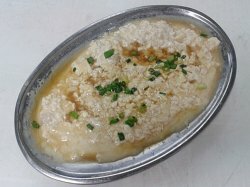 It may looks like a plate of simple steamed egg, but there are two other ingredients in it – fish paste and tofu. It was perfectly steamed where all the three ingredients, egg, tofu and fresh fish paste are well balanced and presented a harmonious dish with smooth textures and simply delicious. 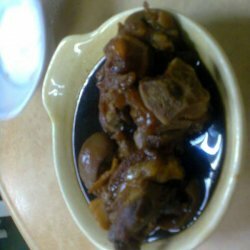 Restaurant SekMeChoy is well known for their signature Bak Kut Teh in Pepper Soup. They are the pioneer who has started this delectable dish in Malaysia. 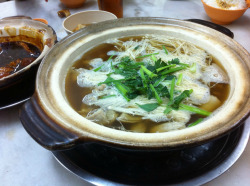 They have also been voted as the Top 20 National Kings of Bak Kut Teh in year 2006. 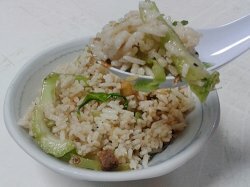 The special kai choy (mustard) rice 芥菜饭, was very tasty and delightful. It was only RM2 per bowl (small), while stock last. 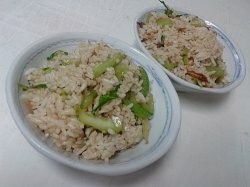 This kai choy rice is quite good in demand and usually it will finish quite fast. Ingredients for the special kai choy rice are finely chopped siew yuk (roasted pork), dried shrimps, shallots, black mushrooms, garlic, and being cook together as special kai choy rice. Yummy! 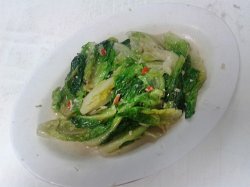 The lettuce with fermented bean curd 腐乳油麦, is a common stir-fried veggie dish. 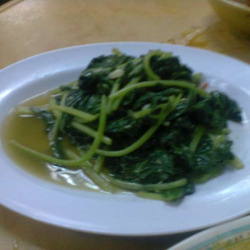 This is also one of my favorite stir-fried veggie that I regularly ordered. Basically the ingredients are fresh lettuce, fermented bean curd, garlic, red chili and other seasoning. The lettuce was fresh, crunchy and tasty with a robust flavor from the fermented bean curd. This veggie dish will open up appetite and matches well with rice and any kind of dishes. 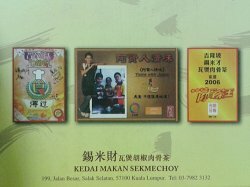 Restaurant SekMeChoy 锡米才胡椒肉骨茶 is at salak south and actually this simple restaurant is nice to dine in for the food is also great taste. service is friendly and pleasant. here nice served hot and all the ginger aroma absord inside the chicken. 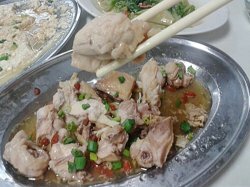 the chicken meat is juicy and the minced pork is also delicious and add with the crunchy vegetables. restaurant sek me choy is recommend by my dad so we went here at the salak south. so easy to access this place and we even taking the public transport here by the star lrt and can reach here within few minute to walk nearby only. simple restaurant serving nice food with the famous here is this claypot ginger chicken pot with lots of ginger and good to have this to expel wind. restaurant sek me choy is nice place to dine here. 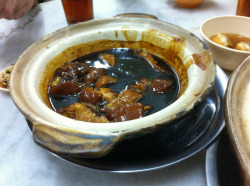 here is famous of the bak kut teh as well. but i just come here to try their ala carte menu and order some of the signature dish. 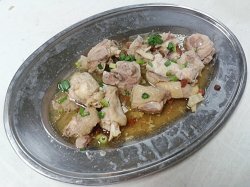 the pork vinegar is very delicious .succulent and the pork is very juicy already have inside the taste of the vinegar and the gravy is so thick. very delicious to have this with a bowl of rice. this place callled sek me choy is very nice place to dine in . the taufu or beancurd is very nice and very big portion. 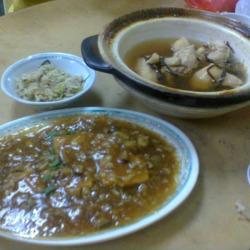 the ginger chicken claypot is very tasty and served hot with some ginger wine taste inside.here also have bak kut teh dishes and famous of theBah Kut Teh and Fried Intestine, and the price here is quite reasonable. 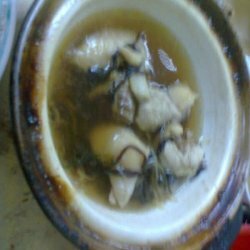 the claypot ginger is very nice served hot and all the ginger aroma absord inside the chicken. also the vegetables here are the crunchy potato leaves very tasty too. Bah Kut Teh and Fried Intestine, and the price here is quite reasonable. the claypot ginger is very nice served hot and all the ginger aroma absord inside the chicken. also the vegetables here are the crunchy potato leaves very tasty too. clean environment with nice service. having dinner here is very enjoyable during wekeends and by lrt i can reach here too stopping by tasik selatan station only. 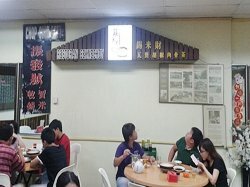 Kedai Makan Sek Me Choy No. 195, Jalan Besar,57100 Kuala Lumpur.opposite to a police station. You will never miss it out as it is rather stand out with 3 shops continuously stick together. here is nice place to have bak kut teh as well. but i just come here to try their ala carte menu. the ginger port chicken with wine is great . the potato leaf vegetables is fresh and i like it stir with garlic. really delicious and top up with one pork with vinegar sauce. very nice taste. here also famous of their steam fish and baked salted chicken are also their signatures. However, the baked salted chicken is only available in weekends. SekMeChoy is closed on 1st and 15th every month of the lunar calendar. nice place to be for family dining.